French President Emmanuel Macron will visit the shrine of New Afrika and is expected to attend an event labeled "A Celebration of African Culture" while the singers, Yemi Alade and Femi Kuti will perform at the event in Ikeja, Lagos on Tuesday. 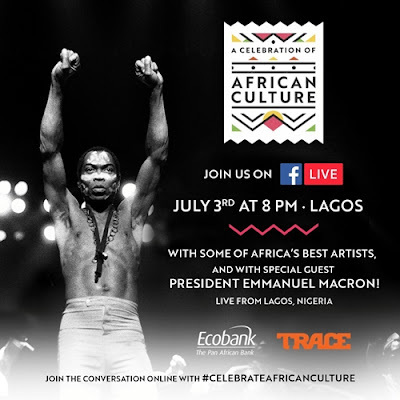 According to reports, the French president will also announce the launch of the African Cultures Season 2020 in France, as part of a cultural event organized by TRACE. Several VIP guests, including representatives of the African creative and artistic sectors, have been invited to attend the multicultural event. A scene from the Nollywood movie will also be filmed live at night by Kunle Afolayan, a famous film director. It is also expected that Charlotte Dipanda, a Cameroonian singer, will perform at the event. Olivier Laouchez, co-founder and CEO of TRACE, "TRACE's mission is to support, nurture, appreciate and celebrate Afro-urban music and cultures and take them to the world, because we believe that the world can only benefit from a better understanding of the richness and diversity of these cultures, which have long been undervalued. "It is for this reason that we have organized this momentous event, to launch the African Cultures Season 2020 in France." One of the objectives of this season is to change the French perception of the African continent through the promotion of contemporary African creation, and this is what TRACE strives to do every day. "